With a steaming hot cup of coffee warming our hands, we stare in amazement at the view before us. There is a slight chill in the air as we stand in the darkness, the sun has not yet risen. There is nervousness and trepidation from the small crowd that has gathered. Some have flown before, for others it’s the first time—you can tell who’s who. Flashes of fire cut through the pitch black as enormous balloons are inflated around us. 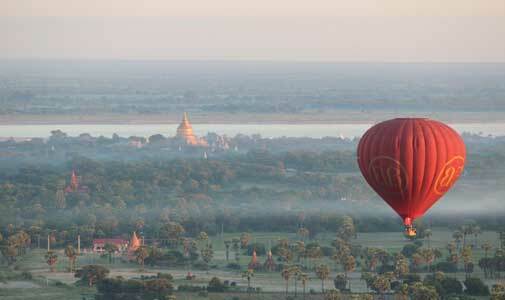 We are in Bagan in Myanmar, the old Burma, preparing to take a sunrise balloon flight. A month travelling through Myanmar would not have been possible if we had not given up our corporate jobs and hit the road. Once we took the plunge, we discovered it was actually cheaper for us to travel than to sit on our sofa back in Sydney, even factoring in the occasional splurge like this balloon ride. It’s not the cheapest activity, but it’s worth it. At $470 per person, a 45-minute ride with champagne and breakfast is equal to 10 days of our current travel budget of $92 per day. But we can justify the expense. Travel throughout Asia is great for our budget. We can live very easily on $40 per day for the two of us, including accommodation and meals. Add up those savings over 10 days and we can happily afford the luxury of our balloon ride. To the east, the sky is changing colour; the pink hues are stunning against the blackness of the night. The now intense ‘whoosh’ from the burner as it inflates the balloon signals it’s time for us to settle ourselves into the basket. A slight bump and we are off. The already cool air becoming colder as we float higher and higher. We drift up over hundreds of temples, pagodas and stupas. The Irrawaddy River below us winds through the lush green countryside where we watch day break and villages come to life. Workers head into the nearby fields and we can see children skipping along the dusty paths to school. Bullocks take a moment from their grazing to see what the noise above is all about and barking dogs run for a minute, enjoying the chase, then promptly give up. The balloons in front of us make a spectacular sight, their vibrant colours dotting the sky. 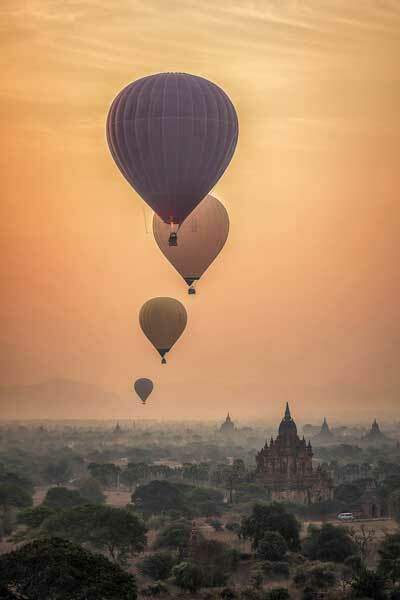 We soar over the spires of Bagan’s stupas, pagodas and temples, our pilot pointing out the largest and most beautiful—the Ananda Pagoda. Its gilded spires shimmer in the early morning light. Forty-five minutes flash by too quickly. The set-down spot looms in the distance as we are instructed to take our landing positions. The landing crew greet us with chilled glasses of champagne as we head towards our breakfast buffet. Everyone has a story to tell, photos to share and videos to play. The next hour is spent chatting with the other guests, our pilots and the crew. The sun has now risen and the warmth at this hour gives us a hint of the hot day ahead. A ride back to our lodgings through lush countryside in an ancient, open-air school bus completes our morning adventure.